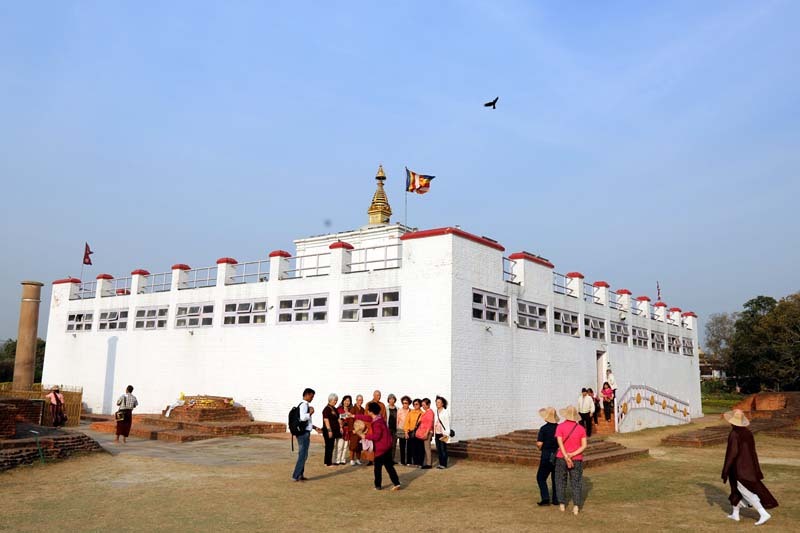 LUMBINI, Dec 2: The tourism entrepreneurs and the stakeholders from Lumbini, the birth place of Lord Gautam Buddha has stressed on increasing connectivity to lure more tourists to the esteemed destination. In an interaction program held in Lumbini this week the entrepreneurs laid their focus on enhancing the connectivity along with smooth and hassle-free services at Nepal-India border to bring in more tourists arriving from Indian side. The entrepreneurs in Lumibini claimed that things to be a bit easier in the Nepali side with claims of processes to be tedious and full of hassles in Indian side of the border. “This has to improve as number of foreign tourists starting the Buddhist Circuits pilgrimage from Nepal will increase manifolds once Gautam Buddha International Airport comes into operation,” Rabindra Sharma, Nepal coordinator of ABTO-Association of Buddhist Tour Operators, said in the interaction. ABTO is an umbrella body of tourism entrepreneurs involved in Buddhist pilgrimage tourism. Headquartered in Bihar, India, it has chapters in different countries, including Nepal. Similarly, Chetan Pant, adviser of Siddharthanagar Hotel Association of Nepal (SHAN), suggested that Nepal and India should start talks about starting railway circuit, connecting Lumbini to other Buddhist sites in India. Lumbini welcomed 136,253 foreign tourists in 2016 which is just a fraction of what other Budhist Circuits sites in India like Bodh Gaya, Sarnath and Kushinagar receive. Most of the foreign tourists come to Lumbini via India.